Six-hole electric pencil sharpener is engineered for high-volume classroom use. Multiple diameter dial fits regular and thick pencils. Extra large, see-though shavings receptacle for easier, less frequent emptying. Safe Start feature prevents operation when receptacle is open. Thermal overload shuts heavy-duty motor off before overheating. 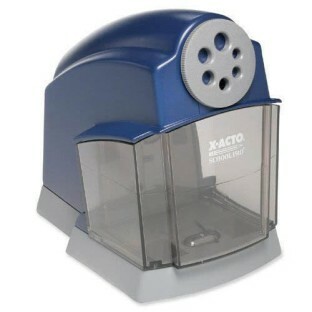 Six-hole electric pencil sharpener is engineered for high-volume classroom use. Multiple diameter dial fits regular and thick pencils. Extra large, see-though shavings receptacle for easier, less frequent emptying. Safe Start feature prevents operation when receptacle is open. Thermal overload shuts heavy-duty motor off before overheating. Auto-resets when cool. Winner of Learning Magazine Teachers' Choice Award. UL listed. CSA approved. 10-year manufacturer's warranty. When I was a classroom teacher this was the only sharpener I used! Now that I'm an Activities Director I want the same quality for all of our colored pencils and regular pencils. It is a great sturdy sharpener! It works just like a pencil sharpener should! No complaints! I use this for my classroom. I'll have 625 kids this year. I'll report back at the end of the year to see if it survived :! This one does not come with the green light that tells you the pencil is sharpened but it works well!